I wonder if I will be the only EDM member without exercise equipment to sketch for this challenge? 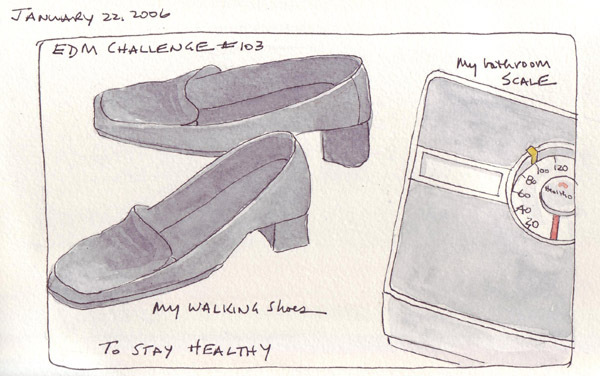 When considering what I really do to stay healthy, I could only focus on really good weight control and daily walking. Obesity is such a major problem in America. When research data is displayed at national meetings that I attend, and the average weights of the study subjects are reported (regardless of the type of medical study), there is always a chuckle from the audience when comparing the numbers from the US in comparison to the study populations from other countries. The only way that I have been able to maintain an ideal BMI as I age is to weigh myself every morning and rein in my food selections and portion sizes. By walking, I really don't mean that I am Julie or Penny (or other EDM members) who walk a fixed distance every day. By living in a city, however, I now walk almost everywhere that I want to go. My car is parked 3 blocks from our apartment and when I get to work I park several blocks from my building. All daily errands are done by walking in my neighborhood and carrying home the packages. Our car remains in the garage, except for work days and we walk long distances in the city on weekends. It is almost exactly one mile with stroller(s) between our apt and that of our grandchildren. This is a huge difference from our previous life in Texas, where the culture is garage door openers and car trips even one block to the covenience store for a newspaper. During those years I took 2 ballet classes each week in the evening after my husband came home from work and our children went to bed. Although I do take occasional ballet classes here in Manhattan, I can't fit everything that I want to do into my usual work week. I now buy walking shoes that move comfortably from work to play and wear out one pair of these shoes every several months. 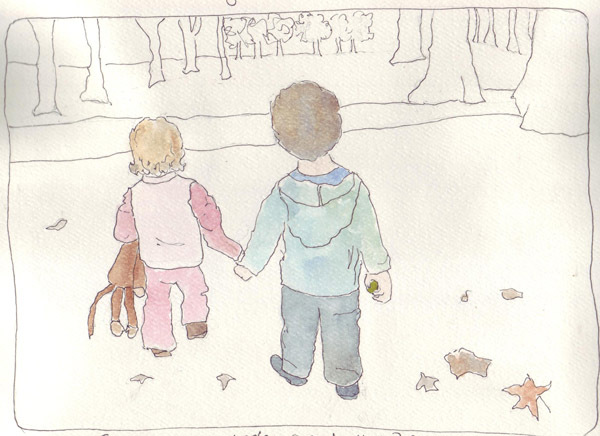 I sketched a photo of Sydney and Henry in Hyde Park - intending to do a "city park landscape" painting. But I never got around to finishing it when we were in London, and today decided to add a watercolor wash to both of my grandchildren and then call it done. I have a series of similar pictures of the two of them. Sydney, who just turned 2, says to Henry "hand!" when we are walking with both of them and sweet boy that he is, he takes her hand and walks with her. 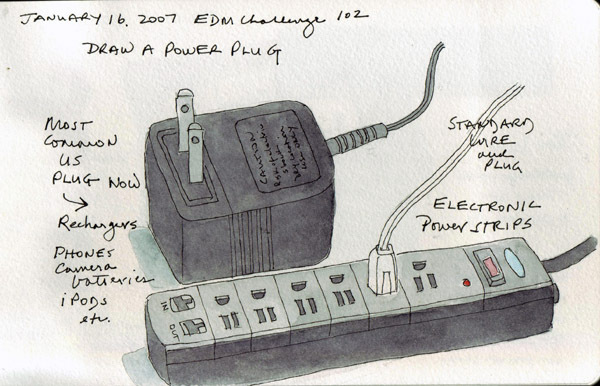 I feel as if we now live in a world of power strips and plugs that are huge and heavy to recharge our electronic devices. And when we go to London we need equally large UK plug adaptors in which to plug these huge recharger plugs to allow us to recharge everything while we are visiting. I too wish we lived in a simpler world - where all of our modern conveniences were interchangeable. At my daughter's home in London there are separate DVD players for those DVDs bought in the UK and those from the US. One of my goals for 2007 is to draw more human faces and figures. 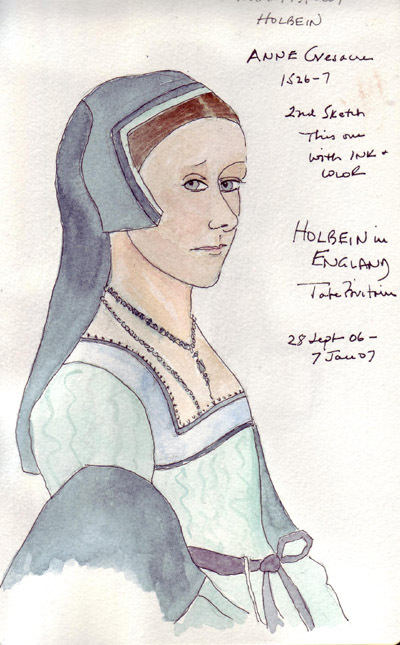 I sketched the Holbein drawing of Anne Cressacre again and this time added a watercolor wash. 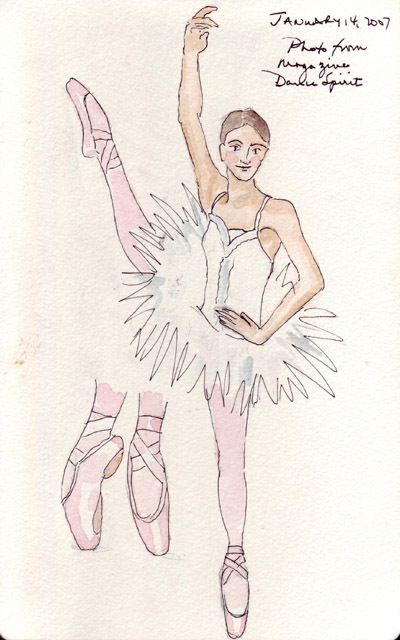 In addition, I started what I hope will be a series of dancers taken from photos in dance magazines and programs from our New York City dance companies. I think it will be fun to struggle through these exercises - I certainly need many days just drawing hands! We are now home from our Holiday visit to London and I have two more journal pages to upload - completing my second London Travel Journal. This is a portion of a clock at Michael Hoppen Photography on Jubilee Place in Chelsea. I visit the gallery each trip to see their new exhibits and always take more photos of the clock. However, I never could really see the hands of the clock because they were overlapped at 3:15. 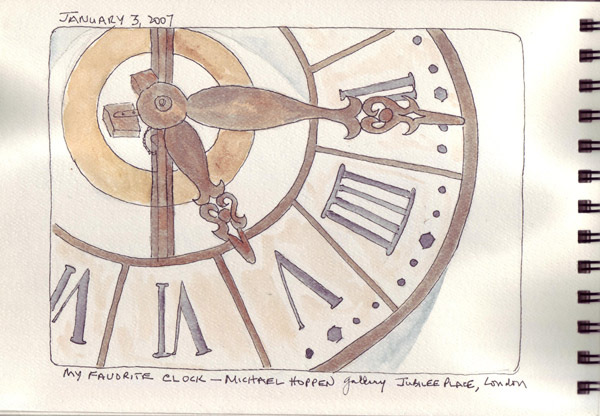 During this visit Michael Hoppen himself got a yardstick and leaned over the open stairwell to change the time so I could sketch the clock hands. 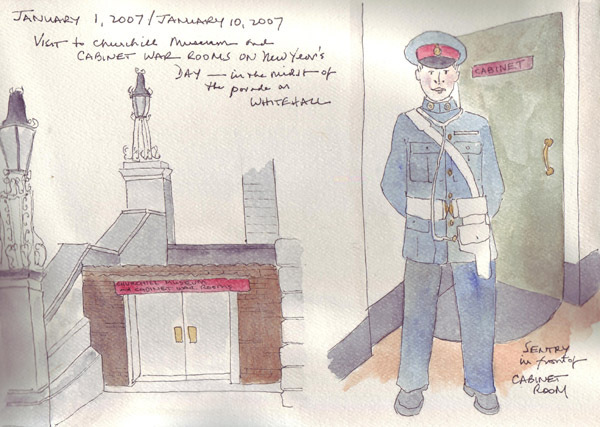 On New Year's Day we wandered through the crowds assembling for the parade on Whitehall in Westminster and went to visit the War Cabinet Rooms and the new Churchill Museum. I sketched this on the last page of my journal after we came back to New York from photos that I took of the entrance and of the sentry (mannequin) who is quarding the War Cabinet Room. The scans could be better, but it was difficult getting the final 2 pages of the journal to stay flat. I wasn't sure that I was going to enjoy the Cachet Linen Watercolor Journal, but I now have completed two. I am able to paint on both sides of each page so I have approximately 50 pages in each book. When my daughter told us they were moving to London for one year, I had no idea that I would be able to maintain a travel sketchbook and have so much fun doing it. I love looking back through the pages and remembering each day of our visit. Some of the pages reflect activities in the lives of my grandchildren and each of them spends time looking through the journal for their favorite page - Pooh bath toys for Sydney and 5 cars from the Disney movie CARS for Henry in this volume. We have 2 more visits planned before they come back to New York, so I think that I'm hoping to finish a 3rd journal. I'm so glad that I ordered multiple copies because I haven't seen these in any art store and only on one website.